Egyptian search teams have recovered "more body parts" and other debris from a site in the Mediterranean where the missing EgyptAir flight is assumed to have crashed on Thursday. EgyptAir said on its official Twitter account that the Egyptian army and navy had found body parts, luggage, passengers' personal belongings, and plane seats. The military had said earlier on Friday that it had located "personal belongings of the passengers and parts of the plane debris," in the sea 290km north of Alexandria. The Egyptian authorities, assisted by forces from France, Greece, Britain, Cyprus and Italy, continue to scour the search area for futher debris from the plane that disappeared from radar while flying over the Mediterranean on Thursday. All 66 on board are presumed to have perished. The Airbus 320 jet, which was flying from Paris to Cairo, disappeared from radar screens shortly after entering Egyptian airspace early on Thursday morning. Later on Friday, the European Space Agency said that one of its satellites had detected a possible oil slick in the Mediterranea Sea in same area where the Airbus vanished. The image, taken by satellite Sentinel-1A at 1600 GMT on Thursday, shows a slick about 2 km (1.2 miles) long, roughly 40 km southeast of the aircraft's last known location. A second image taken at 0400 GMT on Friday showed that the slick had drifted by about 5 km. The ESA said it had passed on information related to the image to relevant authorities but said there was no guarantee that the slick was from the EgyptAir plane. It said another satellite, Sentinel-2A, would pass over the same area on 22 May. 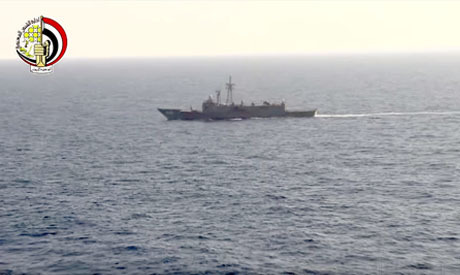 Egyptian state television aired video footage of Egyptian air and naval forces during the search process. Greek Defence Minister Panos Kammenos said earlier that flight MS804 had swerved sharply and plummeted from 37,000 feet to 15,000 before plunging into the sea. Egyptian President Abdel-Fattah El-Sisi offered condolences on Friday to the families of victims of the tragedy, declaring his country's official confirmation of the deaths. The head of the Coptic Orthodox Church, Pope Tawadros II, said a mass service would be held for the deceased at Cairo's Abbasiya Cathedral on Sunday. Three French investigators and a technical expert from Airbus arrived in Cairo early on Friday to assist in the hunt for the missing passenger jet, airport sources said. AP reported that three British investigators also arrived to the Egyptian capital to help in the probe. EgyptAir said it had formed a committee to investigae the crash, adding that the Airbus representative is taking part in the investigation. Egyptian Prime Minister Sherif Ismail said on Thursday that it was premature to "rule out or confirm" any scenario behind the disaster until the search process and probe is completed. However, the country's civil aviation minister, Sherif Fathi, told reporters the chances that the Airbus was downed by a terror attack were "higher than the possibility of a technical failure." French President Francois Hollande said on Thursday that authorities in Paris had also opened investigations. French nationals made up the second-largest number of passengers on board the doomed plane, at 15. Thirty Egyptians, including seven crew member and three security personnel, were on board. The other passengers included two Iraqis, two Canadians, and one each from the UK, Belgium, Chad, Sudan, Kuwait, Algeria, and Portugal. Among the Egyptian victims were four members of the same family: Salah Abou Laban, his wife Sahar Koueider, their son Ghassan Abou Laban and daughter-in-law Reem Al-Sebaei, a family friend said. Several families of French victims arrived in Cairo late on Thursday to get news on their loved ones, Egypt's state news agency MENA said. EgyptAir said on Friday it had enlisted the help of international emergency group Kenyon to "assist with the care of those touched by this tragedy." The cause of the crash is yet to be determined, but there are fears of a link to IS militant group, who claimed to have downed a Russian passenger plane in October 2015 which took off from the Egyptian resort town Sharm El-Sheikh and crashed in Sinai, killing all 224 on board. My heartfelt condolences and love to all the families who have lost loved ones in this dreadful tragedy. Regardless of the cause of the crash, why don't we Arab's blame Israel? We blame them for everything else so let's make up some more lies and blame our Jewish cousins for this tragedy once again. Oh course, we should blame the Zionist entity, because Mossad and ISIS/Hamas/Muslim Brotherhood are all fingers the same hand! What a shameful comment by "Amed" with the phony name. A tragedy has occurred, people have died. "Amed" writes about Israel. Shame on you.